Finally I got around to putting up more Lydia pictures. You can go here to see the newest ones. You can go here to see the entire gallery. My baby started having temper tantrums around age one. He’d throw himself on the floor, kick, scream, and cry until he almost turned blue. I didn’t know what to do. Finally I thought, ‘What would I want if I were having a tantrum?’ I’d want someone to comfort me. So that’s what I did. I picked him up and held him tight and let him cry. Then I began talking to him in a shooting voice. Eventually he calmed down. I’m not sure if he knew why he was so upset, but human contact seemed to be the cure. Sometimes we just need to be held. I ordered me a FON LaFonera a few days ago (for free nevertheless). It just came and I just got it set up. What’s FON? Well, if I share my internet connection here, I can use other FON connections for nothing. Sweet! And it didn’t cost me a dime. My big concern was security; however, it looks like they have that taken care of. When I access my FON access point, I can’t see anything on my local network. Pretty cool. If you are ever around where we live, just give it a whirl. [Update 2012-12-25 22:21:15] The LaFonera link I had went stale. I’ve redone the link. Well, once again, I find myself up with Cyndi and Lydia asleep. This morning, before Lydia went to sleep, she and I read today's My Utmost for His Highest together. This was rather neat and something I'm going to try to continue. We went to the pediatritian yesterday. Lydia had gained another 5 ounces. That puts her within ounces of her birth weight by the 8 day mark. The dr. was certainly pleased. In fact, she gave us the ok to let Lydia sleep a bit longer at night since she is doing so well. The jaundace is almost gone too. I just wanted everyone to know that I have uploaded some new pictures of Lydia. Cyndi and I gave her the first bath at home over the weekend. If you want to see those pictures, they are in the gallery. Or, you can jump to the new pictures by following this link. It has been an exciting, amazing week in the Maxson household! God has so blessed our little family!! I was ready to go last Sunday in the wee hours of the morning when my water broke. We certainly weren't expecting to hear that Lydia was breech and would need to arrive by C-section when Dr. Bendheim checked me around 8 am. It was pretty disappointing, but he was very encouraging and, judging by how I have felt since the surgery, he did a GREAT job! Words cannot describe how it felt to finally see her and hold her. Including the time it took the Dr. to finish stitching me up, we had more than an hour to bond…so she got to nurse and be loved on by her adoring mommy and daddy. Henrico Drs. provides excellent maternity care. All the nurses were wonderful and took great care of Lydia and I. Not that I didn't experience some pain and discomfort, but it was more than worth it every time they brought my precious daughter to me or I walked down the hall to get her. We enjoyed having a room to ourselves and having Matt with us every night. And it was great to have some special friends and family stop by to visit. But my favorite part was taking her home! I'm not ashamed to say that it is a little intimidating to go from having a team of nurses taking care of us to being on our own, but it is awesome to be home. Matt has been wonderful and it has been such a joy to spend time with him as we start the adventure of parenthood. Lydia is such a good girl. She eats and sleeps very well and is, of course, the most beautiful baby ever! We've had our share of tired, cranky moments…both of us…but overall our first week has been incredible!! We have even been out a few times to stretch our legs. We tackled Walmart and Babies R Us on Thursday to get a few necessities, though I'm not ready to take her back anytime soon as people have no sense of personal space when it comes to babies and I really don't enoy getting hassled by strangers who want to know all about Lydia and, what's worse, would have their hands all over her if I let them get close enough. We went to the pediatrician early Friday morning and he was very pleased with how she was doing. She had regained nearly 5 oz of her birth weight (between his final hosp. visit Wed. am and her Fri. appt.) and was exactly where she should be for five days old. 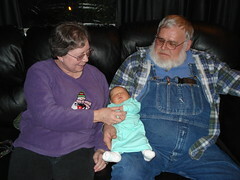 The rest of the day was spent at home, where Lydia got to meet her Clark grandparents. They greatly enjoyed meeting their first grandchild, though they have apparently forgotten how to change a diaper 🙂 We even took an hour to walk around the mall with them on Sat. to stretch our legs a bit. It was nice to get out, even if we were tired by the time we returned home. We're having a quiet day at home to celebrate her one-week birthday. She's sleeping peacefully as of this writing, though I'm sure she'll be stirring shortly for her afternoon meal! Lydia doesn't hesitate to let us know when she's hungry 🙂 It's such an awesome privilege to hold her and take care of her and we're very excited about what week two will bring!! Well, once again Cyndi and Lydia are asleep. I thought I would take this opportunity to post some observations about the basic baby actions–eating, sleeping, and pooping. Eating and Sleeping — Cyndi and I have decided to do the Babywise/Along The Infant Way/Parent Directed Feeding/whatever other name you want to call it approach to Lydia's eating and sleeping. So far, it seems to be working great. We feed Lydia every 3ish hours (never too much more) even if we have to wake her up. She seems to be a very content little girl. She eats very well when we feed her and she's content all the rest of the time. She sleeps very well (so much so that this morning we slept through one of her feedings and went about 5 hours). I don't have any experience with babies; however, I fail to see how some people become trapped in this feed your baby every 30 minutes kick. From day one at the hospital, she's been very reliable eating 10-25 minutes every 2.5-3 hours. Is this normal? If so, how are people sucked into this demad feeding every 30 minutes stuff? I'm interested in hearing about it. Pooping — Lydia poops…alot. I won't get up and count on the spreadsheet (yes, we keep a log just in case the doctor wants to know), but yesterday she dirtied about 8 diapers (5 wet and 5 dirty….some were both wet and dirty). Based on what I've read in books and on the internet about infant feeding, she seems to be doing very well (you make sure they are eating enough based on the number of dirty diapers). She also gained 5 oz from when we left the hospital to her first dr. appointment. So, everything seems to be going well. It's time for me to go wake everyone up so Lydia can eat again. Cyndi has plans to write a summary of the week every week (so you should hear from her later). Yesterday, Cyndi’s parents came for a visit. We are still working out this whole sleeping, eating, pooping thing so they decided to stay in a motel. I know the gallery is getting big….the pictures with Grandpa and Grandma Clark start here in the gallery. Well, Cyndi and Lydia are both asleep at the moment. I'm not tired enough to sleep in the daytime yet, so I thought I would write a bit. First, we had our first multiple diaper change last night. Cyndi had just nursed Lydia and she was dirty. I went to change her….right after I got the new diaper under her, she went again. Well, I held her there for about 30 seconds (just in case it happened again) and decided no more was on its way so I cleander her up and did another diaper. The same thing happened again! I repeated the process, and the 4th diaper wasn't dirtied immediately. Second, I think God has blessed us with a wonderful baby. In the hospital, everything went well, and everything has continued to go well at home. Lydia eats, we hold her a bit and try to play, then we put her down. So far, she is sleeping soundly for 2-3 hours at a stretch. But, I would like to emphasize that even if things weren't going so well, God did indeed bless us. Third, I'm trying to get in my mind that Cyndi and I just caring for Lydia for a short time. I know…18 years (or longer) may not seem short, but if she lives to 80 or 90, most of her life will be on her own. She belongs to God. We only watch over her and teach her right, etc…. While we have to do things right (take precautions, feed her, etc…) God is really in control. He knit her together over the past 9 months. We can take her to the doctor when she is sick, but He is really the one to heal her. We can feed (or attempt to feed) her, but He is the one who makes the food and her body do their thing. I think if I can get this mindset set early, things later on will be easier. Fourth, I'm sure there are people praying for us and Lydia. I'd like to ask that you keep my third point in mind when you pray. Pray that Cyndi and I will do a good job caring for Lydia. Pray that we would teach her right from wrong. Pray that we would raise her and train her in the way she should go. Pray for us that we would remain faithful in our Bible Study through this time of transition. Pray that Lydia would know that Cyndi and I (and the rest of the family too) love her very much. Pray that Lydia would know that Jesus loves her even more than we could. Pray that she would see her need for a savior and accept God's gift of eternal life. Pray that her walk with God after that point would be strong. Pray that she would be willing, as the song says, to go wherever He leads. Pray that we, as her family, would not be a hinderance to that. Fifth, we discovered that just about all of the clothes we bought are way way to big. And the sizes don't make sense: We have stuff that is 0-6 months that is smaller than some 0-3 month stuff. We didn't buy any newborn outfits because we were worried she would be right at the line and wouldn't wear them that long. But, I think we are going to have to go get some anyway. Well, I have written enough for now. When Cyndi feels up to it, I'm sure she will post about the hospital stay in great detail. Two men who are members of Gideons International, the Christian organization that is famous for, among other ministries, placing Bibles in motels and giving them to children, have been arrested after trying to hand out Bibles on a public sidewalk in Florida, according to a law firm. Officials with the Alliance Defense Fund have confirmed they will be representing Anthony Mirto and Ernest Simpson, who were arrested, booked into jail and charged with trespassing. Jeremy Tedesco, one of the ADF’s lawyers on the case, confirmed to WND that the organization’s clients were on a public sidewalk when they were handing out Bibles and school officials summoned police. Did you ever think it could happen in America? I sure didn’t. And I can’t believe that the police actually knew so little about the rights that we as citizens have. [Update 04-06-2007 08:53:45] I have a new post on this issue. You can read the update by going to my post on Gideons, Persecution, and Free Speech .